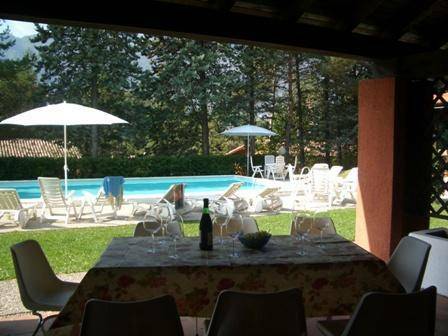 We invite you to have a rest in our private, small family Residence Park Alpini! Our motto: “You should simply pick up all the problems and throw them away. In our residence just relax!” But if there is something you have got suddenly a need of - we are always here and happy to help you to have a most enjoyable and interesting vacation. Our guests enjoy the advantage of a private, closed to unauthorized persons territory, so that you should not worry about your property, vehicles or your children, who can play all over the territory of the residence. Apartments and villas offered for rent at the Residence Park Alpini are equipped with all the essentials for tourist accommodation. Our private pool heated by solar panels is opened for you day and night. But please remember that this place is intended for a relaxing family vacation, so it is our custom to keep quiet at night. Still for the holidays, training courses, corporate events you can rent a large glassed-in heated verandah. And for better variety of winter vacations you can rent a sauna. For those who do not want to part with a computer even on vacation we provide free Wi-Fi Internet connection. We have special free of charge storage space for skis, boats, bicycles and other equipment. 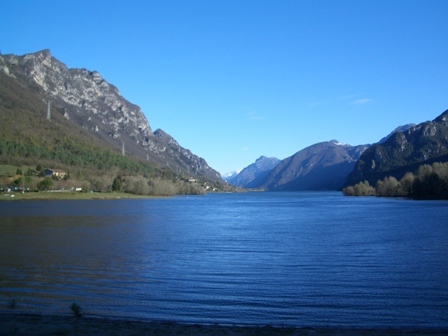 And in 2011 our guests can use free of charge: bicycles, washing machine, table tennis and a compressor to pump boats, mattresses and bicycles. 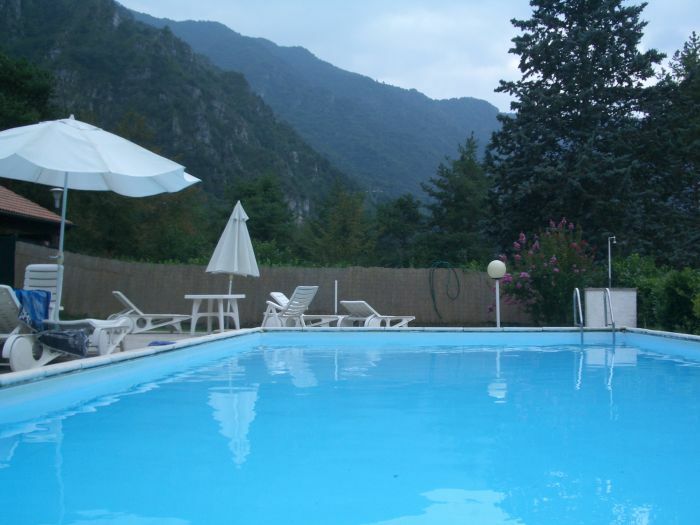 Only in our Residence Park Alpini is the unique dive center on the Lake Idro, where you and your children can have organized games with aqualung in the pool. And you can take your first steps into the underwater world under the guidance of an experienced instructor as well as record a video of this event. The philosophy of renting apartments and villas implies “self-service”, but not in this case. We are always ready and happy to render assistance to our guests. For nearly a decade, year after year we are improving quality of our work in consideration of our guests’ wishes and interests. We select interesting tourist information, organize recreational activities, negotiate special discounts for our guests in the places with good quality and prices of goods and services. At summer our guests can enjoy fresh bread (by means of a kiosk). It is our pleasure to make presents to our guests. 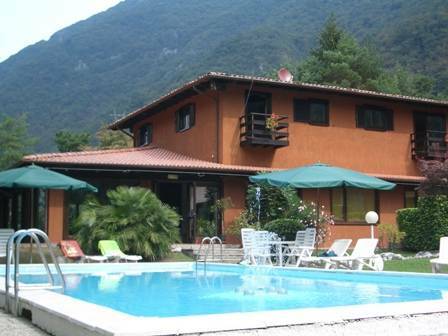 Our residence is located less than 100 meters from the small beach on the Lake Idro. Periodically (as volunteers) we carry out cleaning of that beach. For the season 2011 we plan to: improve our park and car parking, open a new children’s park and a new barbecue area, make a new access road to our villas and apartments, renovate some furniture. That’s why in 2011 we are changing our economic strategy. Now our customers rent villas and apartments on the principle of “All inclusive”, i. e. there are no other costs for staying in the Residence. We hope that all this will help our guests to have a really good rest. At our residence we offer 8 apartments for your recreation. Every apartment has a living area of about 40 m², consisting of a living-room with a fitted kitchen, a bedroom, a bathroom and a balcony with a nice view on the surrounding mountains, the lake or the pool. The living-room is equiped with a studio couch, a wardrobe, a TV with satellite receiver, a table, chairs for the announced number of persons, a table lamp or a ceiling light, a fan, and a clotheshorse. An additional bed is possible. The kitchen is equipped with all necessary for the announced number of persons. At your disposal is a refrigerator, an electric kettle or a coffee maker, an extractor hood and a gas stove. The bedroom has a double bed or three beds (for children), necessary to specify at the order. Also there is a wardrobe, bedside-tables, lamps. The bathroom is equipped with a WC, a bidet, a washbasin, a shower, a mirror. At the residence we offer 4 summer cottages (townhouse style), all with a separate entrance in opposite to the pool. Each summer cottage has at two levels a living area of about 100 m². At the first level you will find a big terrace with table and chairs, a big living-room with a kitchen, a master bedroom, a bathroom, and a storage room. The bedroom for parents has a double bed. Also there is a wardrobe, bedside-tables, lamps. The kitchen is completed with all necessary on the quantity of persons declared by you, also there is a refrigerator, an electric kettle or a coffee maker, an electro extractor hood and a gas cooker. On the second floor are two children's bedrooms. There is a huge balcony with a fine view on surrounding rocky mountains and on pool. The bedrooms have a king size bed or two beds (for children), necessary to specify at the order. Also there is a wardrobe, bedside-tables, lamps. 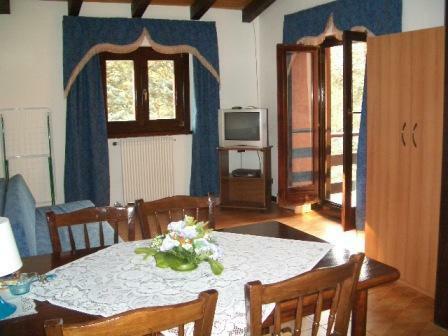 Two Room Apartment includes: Living room - sofa-bed (for two person), a wardrobe, TV sat., table, chairs. Additional beds are possible. Bedroom - double bed, a wardrobe, bedside-tables Kitchen - minimal complete set, a refrigerator, an el. kettle and a coffee maker, stove Bathroom - WC, a washstand, a shower. 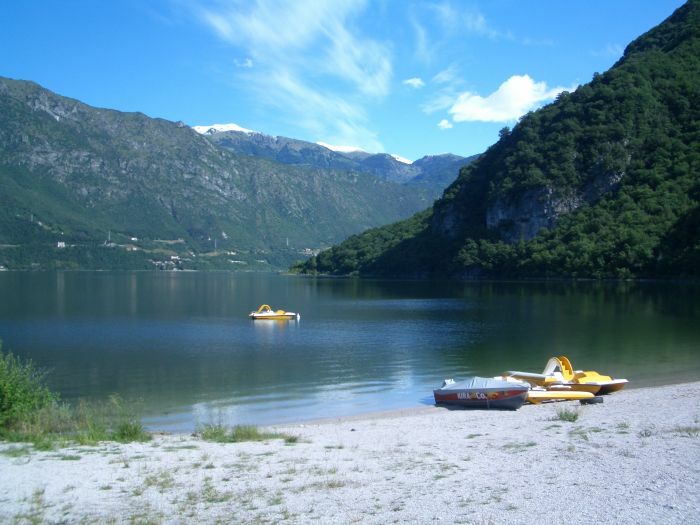 Lake IDRO is located among warm southern slopes of the Italian dolomite Alpes. It does not freeze in winter, and in summer its waters warm up to 30 degrees; that creates a green natural oasis. Here remain some places that “a foot of a man didn’t step on". The crystal mountain streams bear drinkable waters to the lake, where splashes a plenty of fish. The lake has a great success with those who prefer calm, family rest on nature and open sports in clean air. Our country houses and apartments are situated in about 100 m off the lake beach, they are surrounded by a large forest, on the bank of a small murmuring river with drinkable water. Various Alpine tracks Here originate. Payable in cash (credit cards and checks for payment we are not accepted) at the arrival, when receiving the keys. In addition, when receiving the keys to make a securiti deposit of 100 euro. Exit the motorway A4 "Brescia Est"
Upon request for an additional fee provide airport / railway station transfers. Cost per car up to 4 persons in one way.